CNN's John King looks back at Sunday's talk shows and what will make news in the coming week. (CNN) -- President Obama was aboard Air Force One over the Atlantic as this past Sunday's spinning, sparring and explaining played out. He has an increasingly ambitious overseas agenda at a telling time for his already crowded domestic portfolio. At first glance, it's hard to be very optimistic about the prospects of getting Israel and the Palestinians back to the table, let alone back to the difficult choices of peacemaking. Yet the president, fresh from his outreach to the Muslim world, sounds remarkably upbeat. He is sending his special envoy, former Sen. George Mitchell, to the Middle East this week to put his new push to its first test. • Whether Israeli Prime Minister Benjamin Netanyahu is willing to come Obama's way. • Whether Hamas and Hezbollah choose, as they often have in the past, to make themselves heard just when things get to a key juncture. • A critical period for his push to get health-care reform this year. • A rising unemployment rate that sobers the growing chorus of voices suggesting the worst of the recession is over. • And the still evolving confirmation process for Supreme Court pick Judge Sonia Sotomayor. "We want to get them back talking to each other. I think there is a recognition, a broad recognition in the region, that there needs to be progress. One of the great heartening things about the president's speech in Cairo is the enormously positive reaction it generated across the region and around the world and from both Israel and the Arab world we saw positive responses." -- David Axelrod, White House senior adviser, on CNN's "State of the Union"
King: "...many Israelis are asking that you should know that Netanyahu's government in Israel is so fragile that if he ... stopped the settlements now, his government might collapse. And so they ask the question, why do you keep pushing?" "We have to be willing to sit and listen and evaluate without giving up what we view as a primary objective of the engagement, which is to do everything we can to prevent Iran from becoming a nuclear weapon state. I don't think there is any doubt in anyone's mind that, were Israel to suffer a nuclear attack by Iran, there would be retaliation." -- Hillary Clinton on ABC's "This Week"
Stephanopolous: "Several senators wrote the president a letter just the other day saying that North Korea should go back on the list of states who sponsor terrorism. Will you do that? Clinton: "Well, we're going to look at it. There's a process for it... you know, we take it very seriously. I mean, obviously, they were taken off of the list for a purpose, and that purpose is being thwarted by their actions." "I don't think there's any question it's going to be a rough patch, not just in the immediate term, but for a little bit of time, because you've got to turn the economy around, and jobs and job growth tend to come after you turn the economy around, so it's likely going to be a little higher." -- Austan Goolsbee, White House economist, on "Fox News Sunday"
"Somebody had to do something. ... This isn't just about the auto industry. The credit market has dried up. We got a housing industry in crisis. And certainly the federal government had to do something here. I think from our point of view, we're just glad somebody is listening." 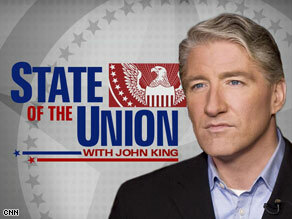 -- Mayor Michael Brown of Flint, Michigan, on CNN's "State of the Union"
Can Obama jump start auto industry? "I know people don't want to see the government involved and you get that dumb argument down there in Washington about the conservatives and the liberals and all that. Who needs it? We need the country working together on our problems. ... I'm not condemning the government. They didn't create the problem." --Mayor James Baker of Wilmington, Delaware, "State of the Union"
"One, we don't know how much it's going to cost and who's going to pay for it. Secondly, it will be the first steps in destroying the best health-care system the world has ever known." -- Sen. Richard Shelby, R-Alabama, on "Fox News Sunday"
"You won't fundamentally solve the problems in business until you solve the problems of spiraling health-care costs. Which is driving everybody crazy." -- Google CEO Eric Schmidt on "Fox News Sunday"
"The Barack Obama experiment is beginning to scare people ... when we're talking about 17 percent of our gross national product on health care, that's what we spend. But, if that Barack Obama experiment with our health care, if that doesn't work, we're also talking about human lives. We're also talking about the quality of our health care." -- Republican strategist Alex Castellanos on "State of the Union"
One year ago this past Sunday, Sen. Hillary Clinton officially abandoned her hard-fought campaign for the Democratic presidential nomination. On "This Week," George Stephanopolous asked her to reflect on the past year. Stephanopolous: "The Economist magazine said this week that the question you raised in that famous 3 a.m. ad...'It's 3 a.m., and your children are safe and asleep. Who do you want answering the phone?' ... is right back in the center of American politics. Has the president answered it for you?" King: "I want to close our conversation by asking you to take us inside the great pyramids of Egypt. The president is on a tour of the great pyramids. He is dressed casually and something on the wall catches his attention. He is shown it by the guide and he is noting the big ears and he calls over David Axelrod and Rahm Emanuel and says, look at this. What was the president telling you?" David Axelrod: "Right. He said, 'who does that look like?' He said, 'it's me'. And I have to confess that the ears were a giveaway. It really did look like him. I was wondering whether someone chiseled that in there in honor of our visit, but apparently this was done some thousands of years ago. So kind of interesting. We didn't know what to make of it. But our guide said that he thinks the president might be descended from King Tut. So we'll see. We have no proof of that. We're not claiming that. But -- and I think perhaps he says that to all the visiting dignitaries. But the ears were unmistakable, I must say."